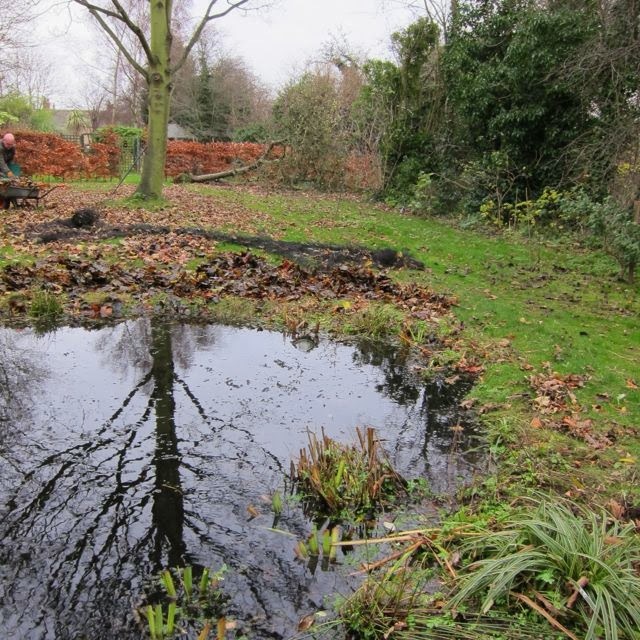 There are lots of aspects to consider when planning a wildlife pond, but I had never thought to ponder on the logistics of Autumn leaf removal. I got as far as thinking that a damn great net should do the job and left it at that. As it happens, we do possess a damn great net which we bought to home the fantail doves under, but that is another story ! So, when Autumn came it was a two man job to spread the net across the pond and peg it down with plastic spikes. Job done ! Trouble was that the volume of leaves was huge and a thick layer built up on top of the net. They were actually in the water, and after a while began to break down, and, I would guess, pollute the water. So, the net had to stripped off the pond, de-leafed and put back. That was a Herculean effort, as it was like hauling in the daily catch ! Very heavy! Finally we removed all the leaves, and put the pristine net back over the pond, leaving piles of slimy wet leaves around the perimeter, to be barrowed away. 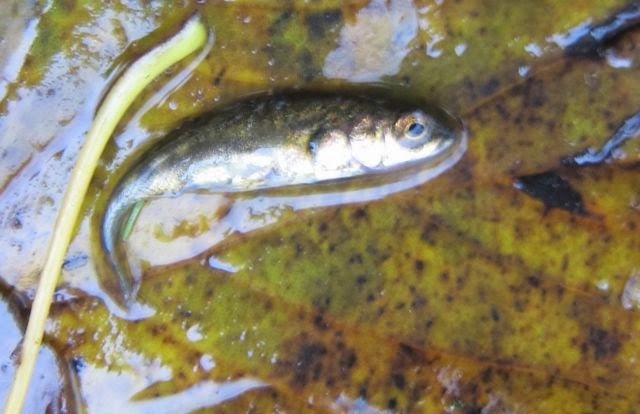 It was only then that we saw little flashes of silver amongst the tawny leaves - tiny beached sticklebacks fighting for their lives! Shoals of them ! We had to perform search and rescue operations and put them back in the water as quickly as possible. Now, I am not scared of mice, spiders, frogs, all animals, most reptiles or birds. But I am terrified of fish! I must have had a traumatic experience with a goldfish in my formative years, because I have a real phobia! As soon as I see fish out of water, flapping and gasping, I am flapping and gasping myself ! 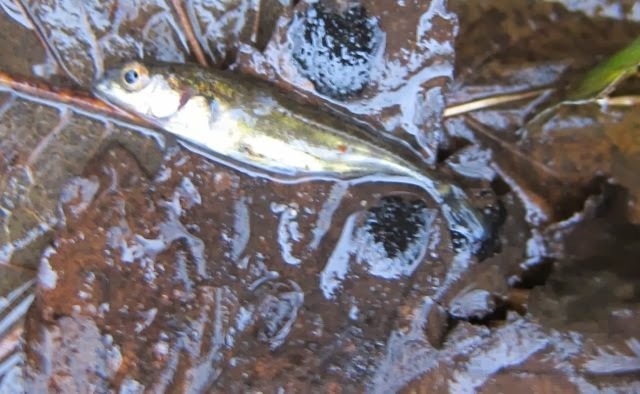 But how could I let all those sticklebacks die ? I couldn't, so I had to overcome my fear, pick them up, and put them back in the water pdq. I must admit that the more I picked up and saved, the easier it became, so maybe I have overcome said phobia! We were having to pick through the leaves and save as many as we could. 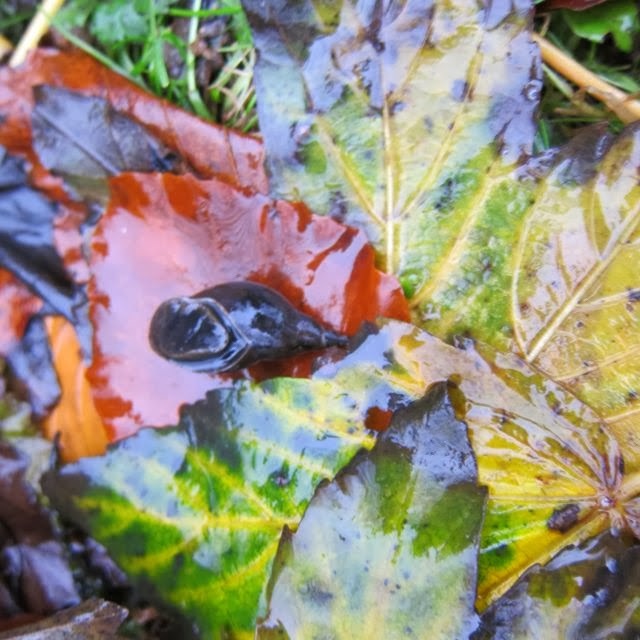 There were also dozens of snails between the layers of leaves too, but they were an awful lot easier than the fish to pick up and put back in the water. I think we managed to save most of them, but I bet there were some that we never found, and they would have perished, poor things. 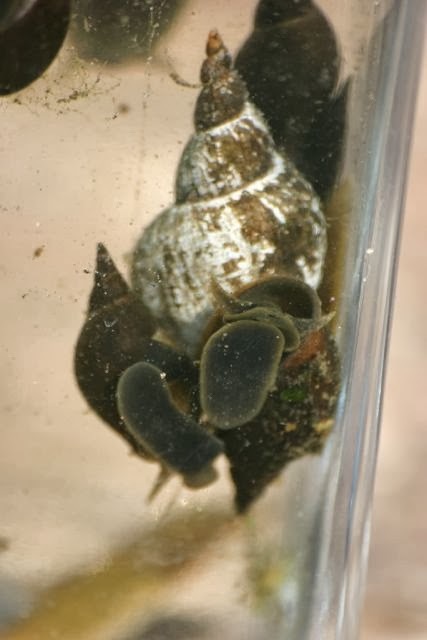 I hope that the snails we failed to uncover would have been able to make their own way slowly back to the pond. 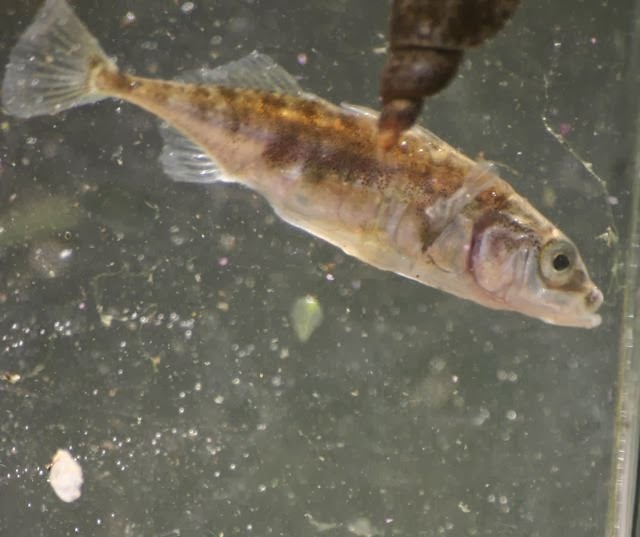 The benefits of a wildlife pond are many and varied, and one of the many pleasures is to have the privilege of watching the sticklebacks living out their lives perfectly naturally. They came from a friend's pond, and we started with a slack handful, and they have multiplied spectacularly over the last two years. In Spring we can watch the males come into their flamboyant breeding colours, and make 'nests ' on the bottom of the pond, before driving the females into them to lay their eggs. 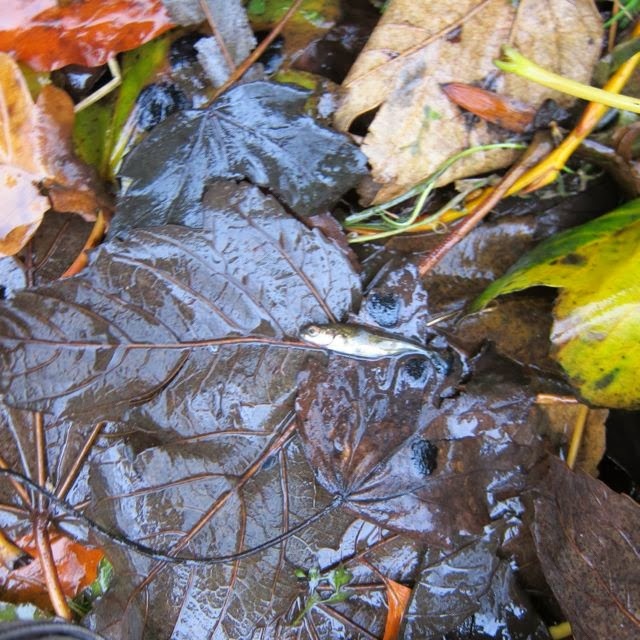 Later on in the season we can watch the tiny fry growing and developing. 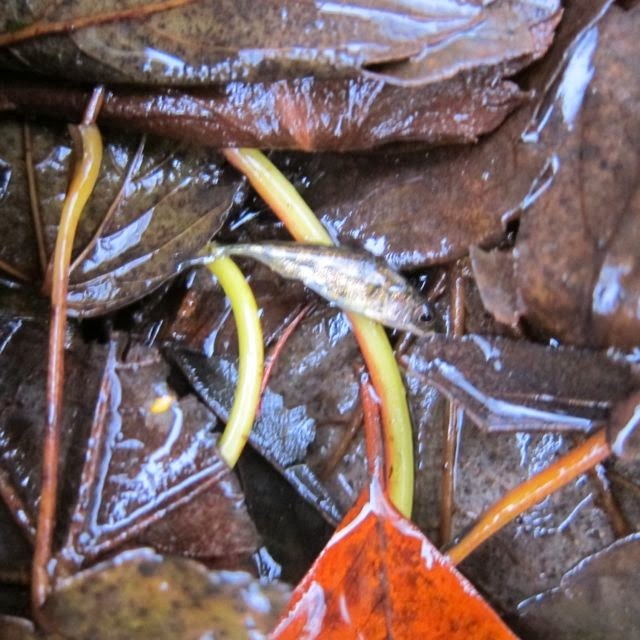 As well as sticklebacks we have breeding newts, frogs leeches, pond skaters and all manners of water beetley things. In the summer we have swallows swooping low over the water, and Damsel flies in the reeds. It is endlessly fascinating and ever changing, and worth any amount of fishy search and rescue missions in the autumn!! Oh poor things! Glad you managed to save so many. The pond looks great now too. Hi Rusty Duck, trouble is, although we saved loads, I haven't a clue how many perished because we never found them. 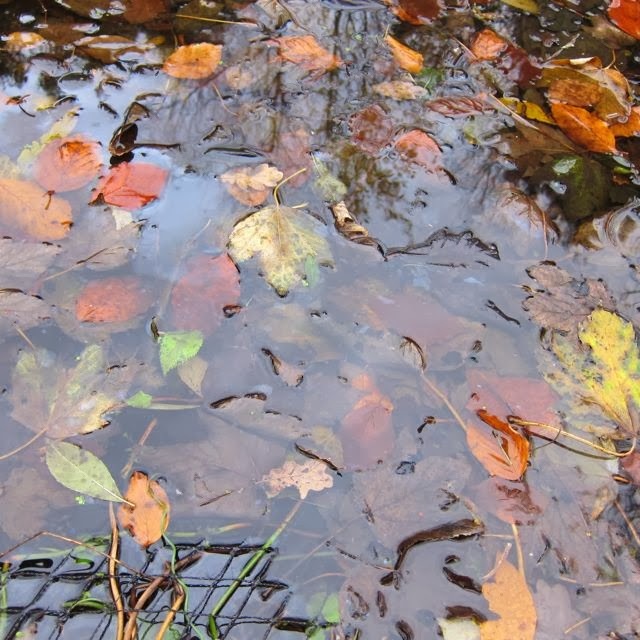 At least the pond is now leaf-free! 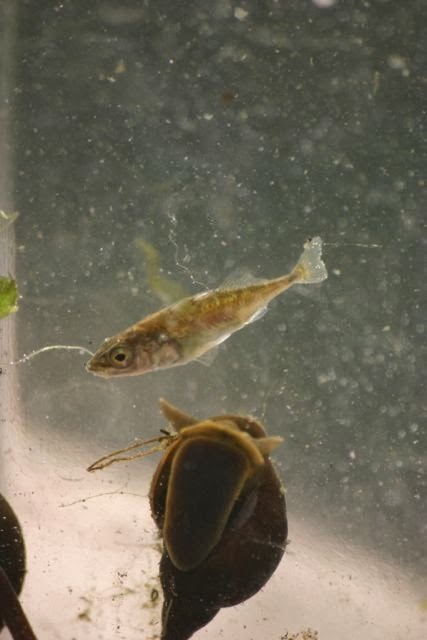 Poor sticklebacks! And well done for bravely saving them despite your phobia. Fish hold no terrors for me, but did you really write that your pond has leeches? Now, that's a terrifying thought. 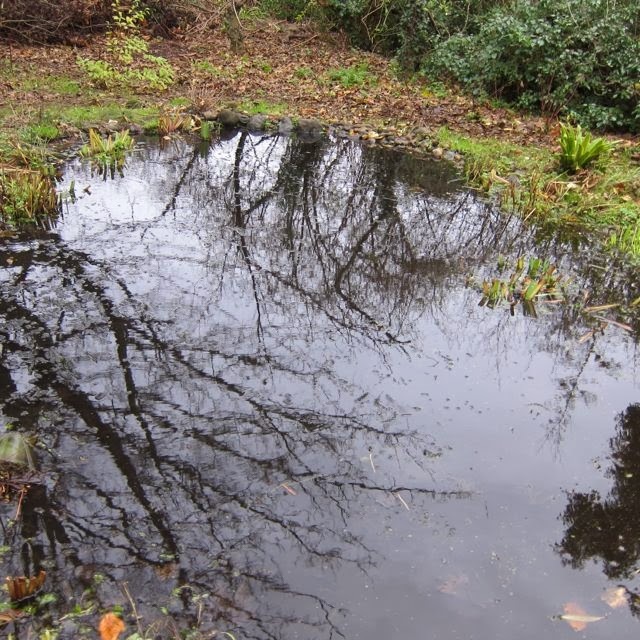 Your pond looks great, by the way, even in winter, very natural. Hi Lyn, it might have been the best therapy for my phobia !! I don't mind our leeches but I have a feeling that your leeches would be WAY more scary than our little tiddlers ! I am so glad you rescued the fish, despite your aversion! But how do prevent marauding herons and water snakes? My neighbor has a pond that used to have fish, but it was constantly raided by the wildlife. Hi sarah, herons are a problem and we had one in the garden only a few weeks ago. They tend to go for bigger fish such as neighbour's koi carp, rather than ours. We don't have water snakes here and if we did, there would be no pond !! Beautiful pond. I am hoping to put in a tiny one or two this year. I don't mind fish and I love frogs. I must say I am with Lyn on the leech thing. I can't believe they have brought them back into hospitals along with my other fear - the maggot and as for snakes - well they are up there with eels on my fear scale. 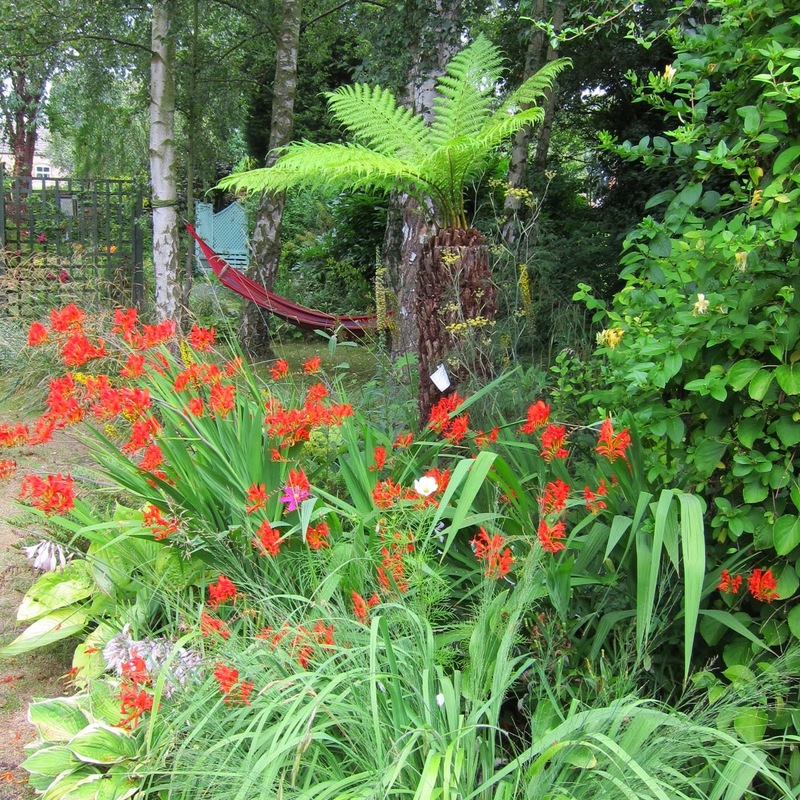 Still no weather for gardening here in Galway but it is always a joy to pop over to your garden and take a peep. Hi Grace and a Happy new year to you! The weather here is stormy so like you, it is garden 0 sofa 1 ! !